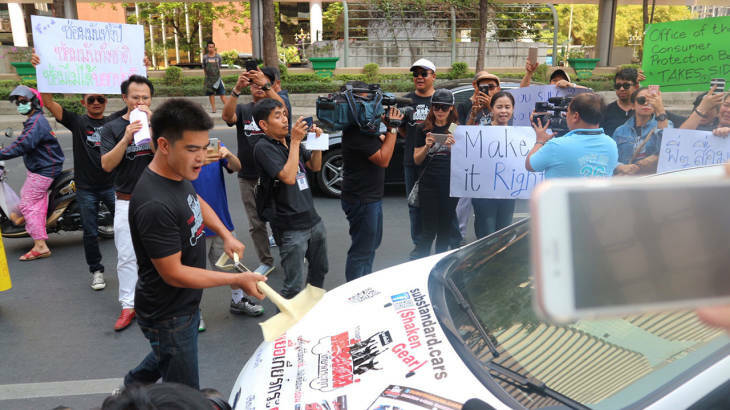 BANGKOK: -- A Chiang Mai man furious with motor car maker Ford took a spade to his own car in a protest in Bangkok yesterday. Attaphon Piawacha, 27, was at the end of his tether after his Ford Fiesta had caused him nothing but trouble since he bought it Thai Rath teproted. The gears don't function properly, the whole car vibrates and worst of all, the brakes don't work. He has been to Ford many times, and his trips to consumer organizations and government offices seeking recompense have all come to nothing. He has had to fly to Bangkok from Chiang Mai eight times. So yesterday he got a spade and started hitting the bonnet of his own car in front of the Ford Sales and Service office in Sathorn Square, Sathorn, Bangkok. And he was not alone in his anger. He was joined by 60 other Ford Fiesta and Ford Focus owners who are not happy with the company or their cars. They read out their grievances and toted placards in Thai and English outlining their woes. One in Thai read: "I bought my car to drive, not to repair it". Another in English said: "You sure you wanna buy one?" Thai Rath said that Ford were not available for comment but they would follow the story. Ford Thailand's reply..................................Mai bpen rai ! Why do parents buy their kids Ford Matchbox cars.....so they will get used to pushing it. FORD: Fix Or Repair Daily......Found On Road, Dead. "The brakes dont work". Who would have thought they would hear that one. This is not a fault. It's a feature in all Thai cars. What was the point, hitting his own car with a spade? Better drive at Ford offices crash, then say sorry brakes not work. After all that is the usual thing here, brakes failed. Were these cars Made in Thailand by any chance? Only ask as usually the good Thai stuff is exported and the crap is left for domestic consumption. Back in 2012 Ford Focus was the best selling car in Thailand. No. That article claims the focus was the best selling car worldwide, a disputed claim. Are those cars made and designed in the USA?? Ford is made here alongside MAZDA.